Wide Profile – They are approximately 50% wider than they are deep. 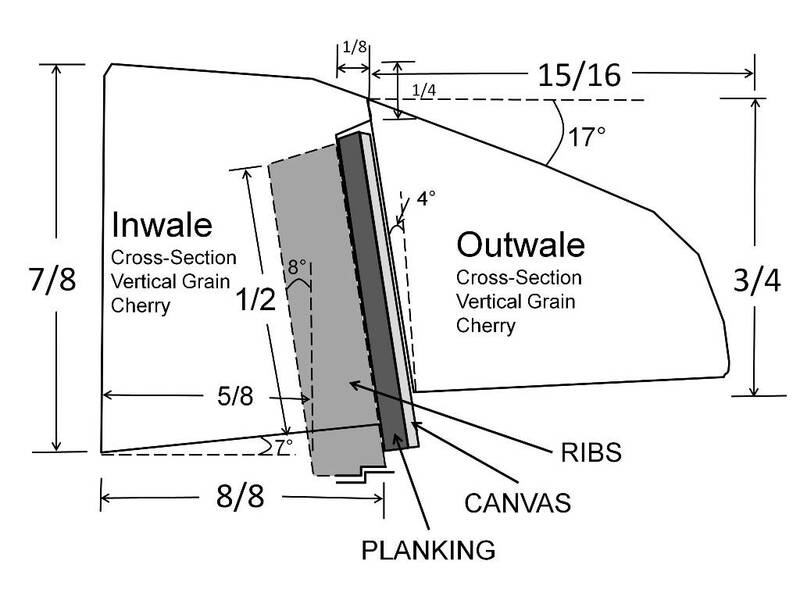 In the cross-section diagram, W ≈ 1.5 x H.
Cross-section diagram of the gunwale system in a 1905 J.H. Rushton Indian Girl canoe. 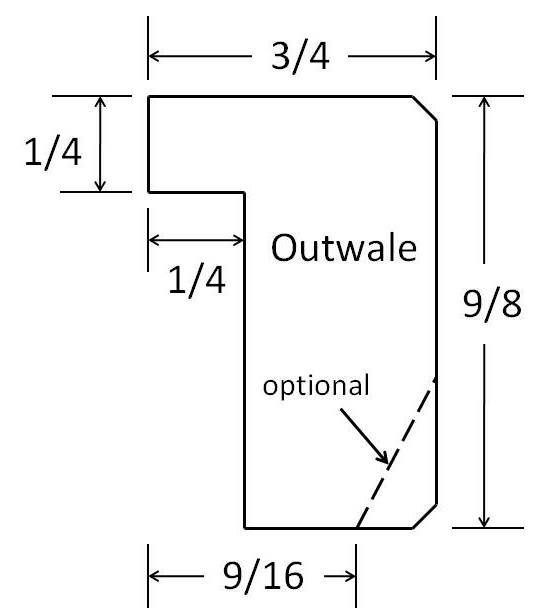 No Rabbet– The inside surface is flat without a rabbet (called a rebate everywhere except North America, it is a recess cut into the inside-edge). That is, they do not cover the top-edge of the planks at the sheer-line. Matches Tumblehome – The inside surface is angled to conform with the tumblehome angle in the hull. 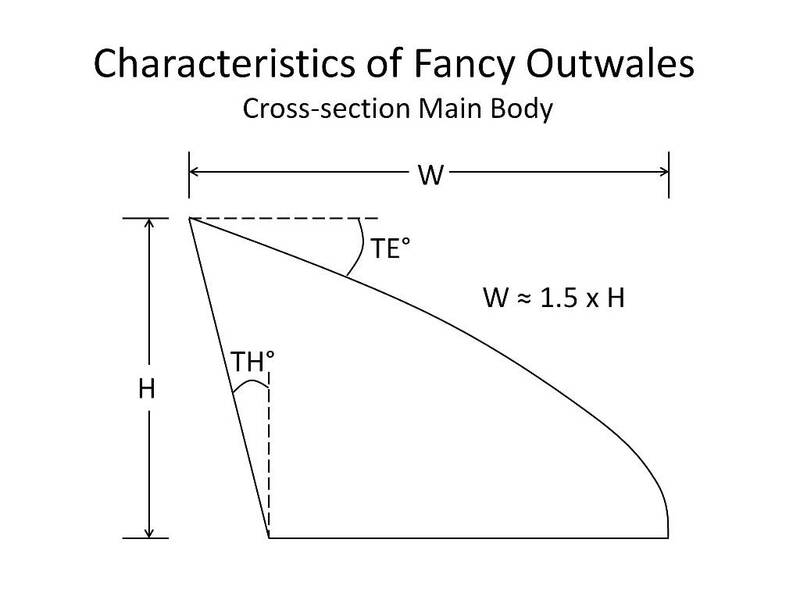 In the cross-section diagram, TH° = Tumblehome angle of the hull at the sheer-line which is generally about 8°. Shaped Top – The top surface is gracefully rounded to taper the top-edge from a thick inside-edge to a narrow outside-edge. In the cross-section diagram, TE° ≈ 15°. 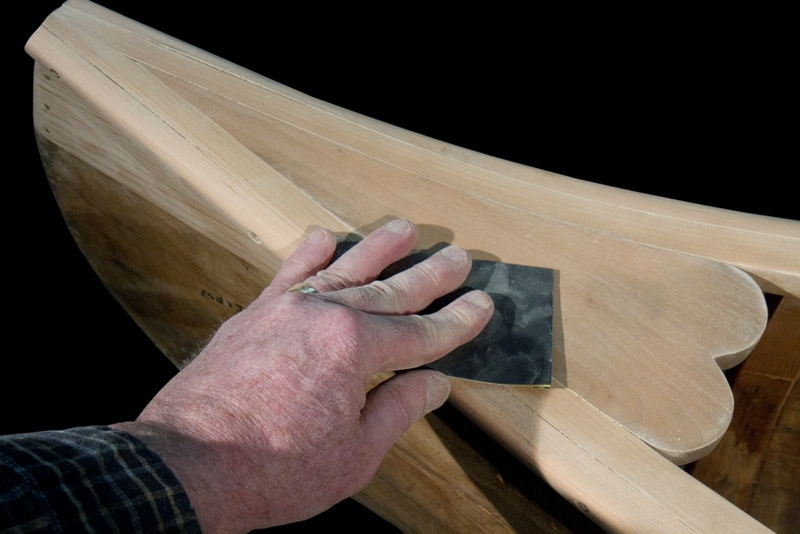 Pre-Bent Ends – The sheer-line of the canoe often has graceful up-swept ends. 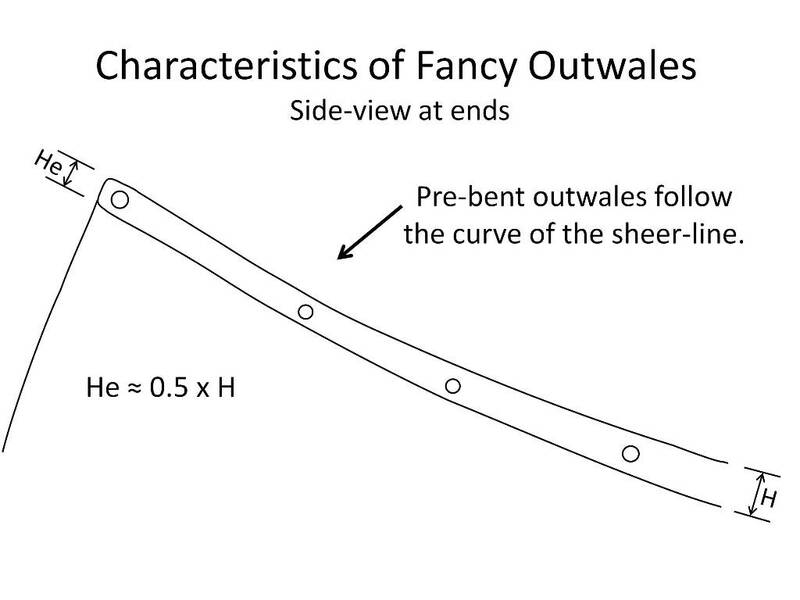 The outwales must be pre-bent to follow this curve (refer to the side-view diagram). Tapered Ends – They are tapered gradually at the ends both in width and height (over a distance of at least 24″ or 60cm). 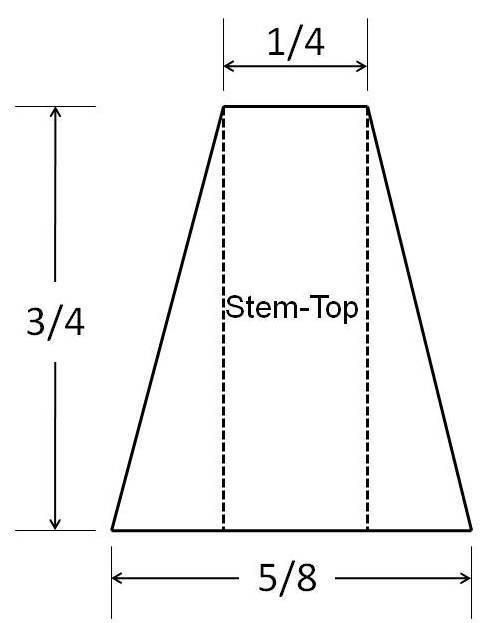 While the width is tapered approximately 50% (We ≈ 0.5 x W in the top-view diagram), the height is normally tapered about 25% (He ≈ 0.75 x H in the side-view diagram). Attached from the Inside – The main body of the outwale is attached (either with brass screws or copper nails) from the inside. 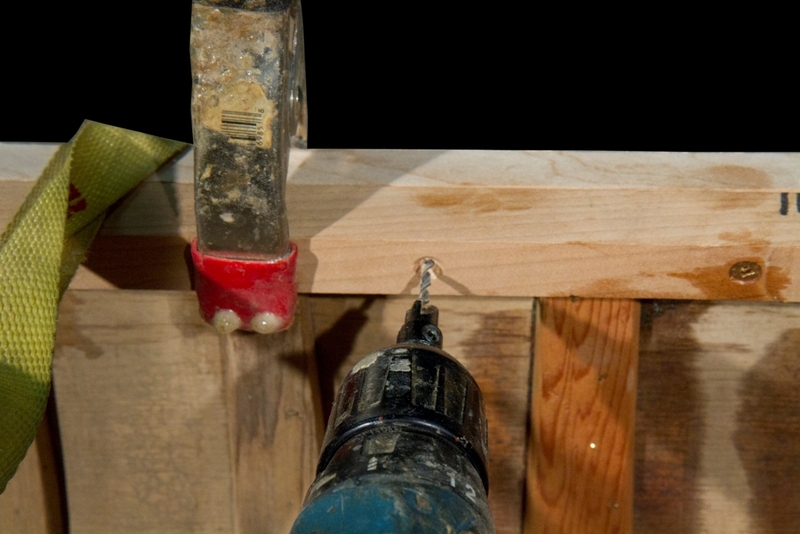 At the ends, the last five fasteners (brass screws) are driven in from the outside (pre-drilled and counter-sunk). For this blog, I describe the steps involved in making new outwales for a 1905 J.H. 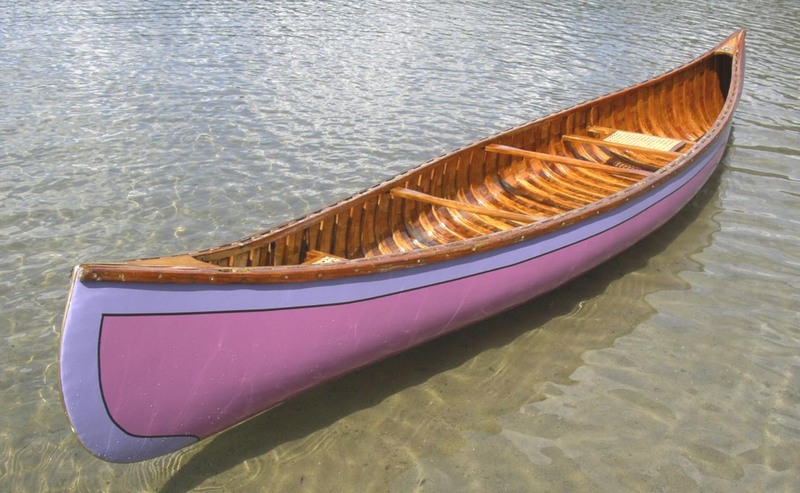 Rushton Indian Girl canoe (wood-canvas). 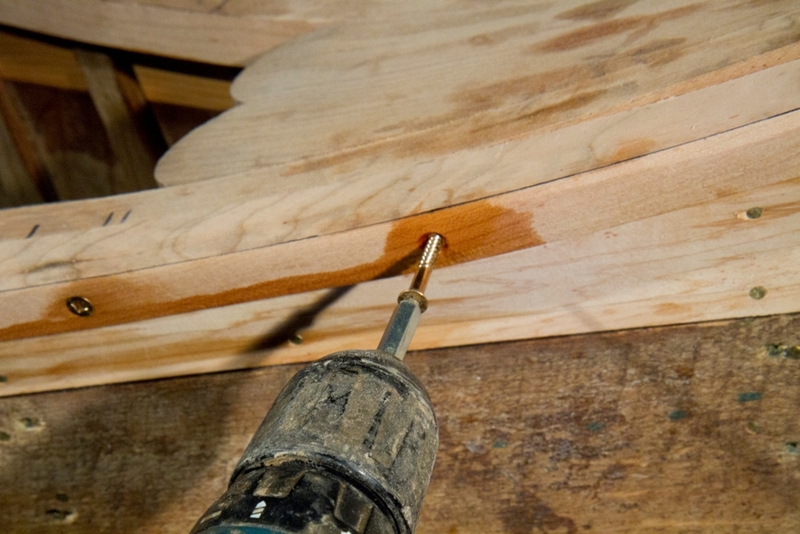 Cut the new cherry stock to rough dimensions on the table saw and cut the tumblehome angle (TH°). Each of the four pieces is at least 9′ (275cm) long. 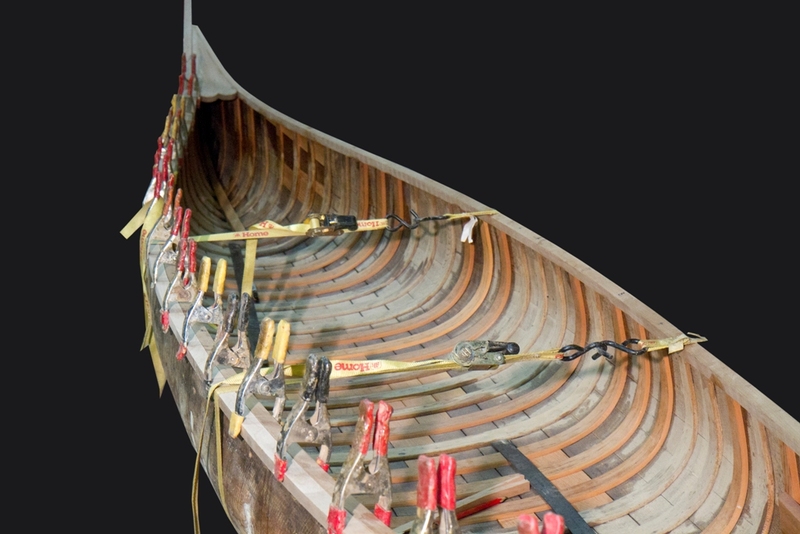 Decide which pieces will be joined together to make full-length outwales for each side of the canoe. Mark them with a permanent ink marker to identify each outwale and mark which end will be soaked and pre-bent. Soak the new cherry for three days. 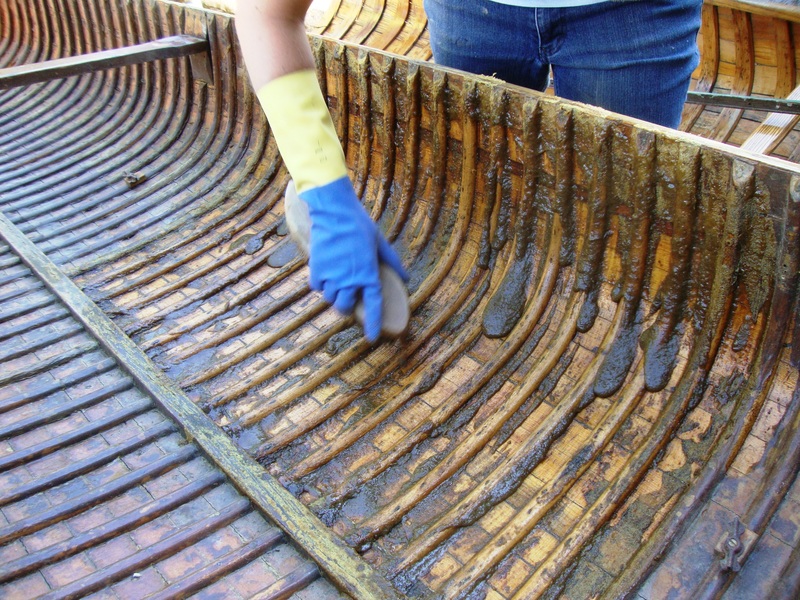 Then, pour boiling water over the pieces and bend them onto the gunwale bending form (no backing strip is necessary). Allow them to dry for a week before removing them from the form. Once bent, cut a scarf joint angle into the non-bent end of one of the two pieces for each outwale. 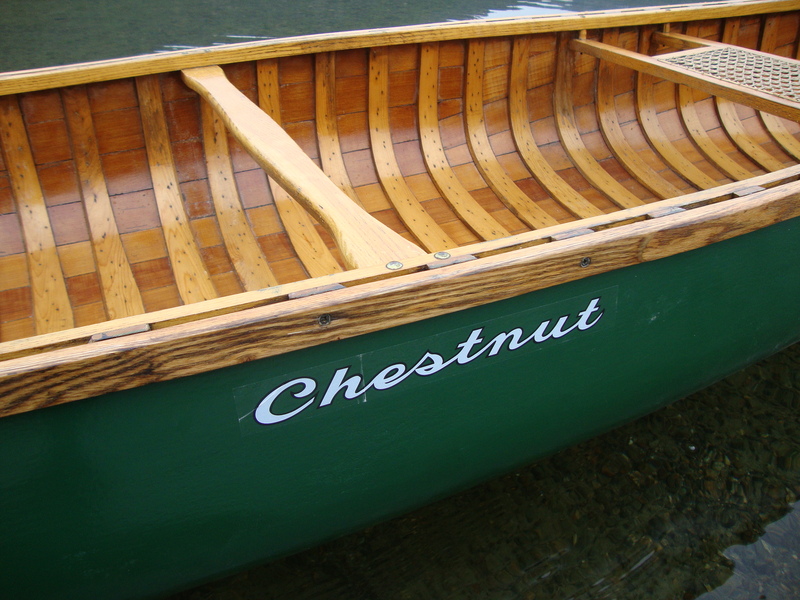 Attach the new cherry pieces to the canoe. Position the pieces so the bend in each matches the curve in the sheer-line of the canoe. 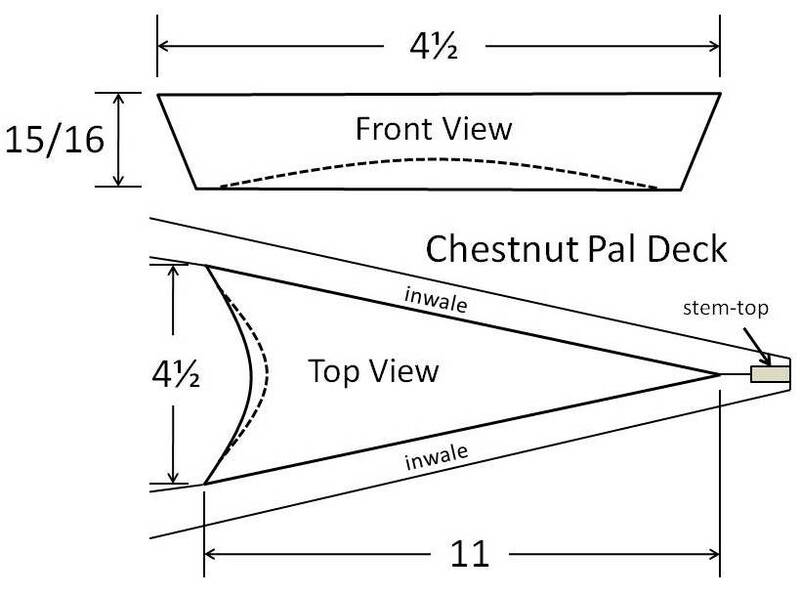 Mark the position of the matching scarf joint angle. 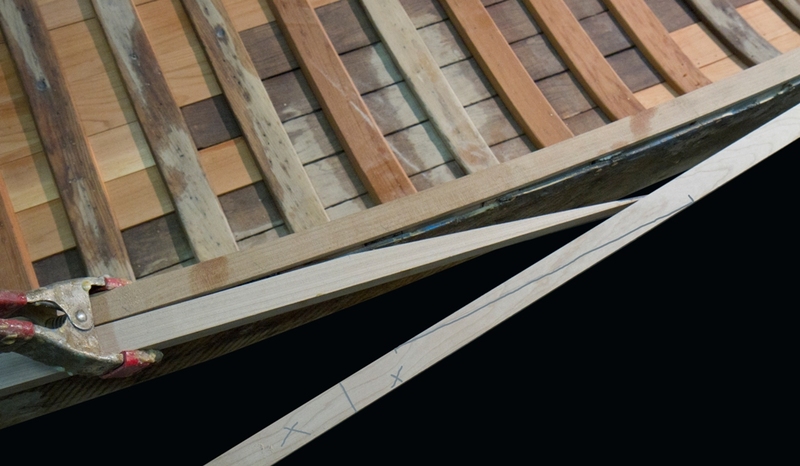 Cut the second scarf joint angle and use polyurethane glue to splice the pieces together into full length outwales. Allow the glue to dry overnight. Sand the joints smooth. 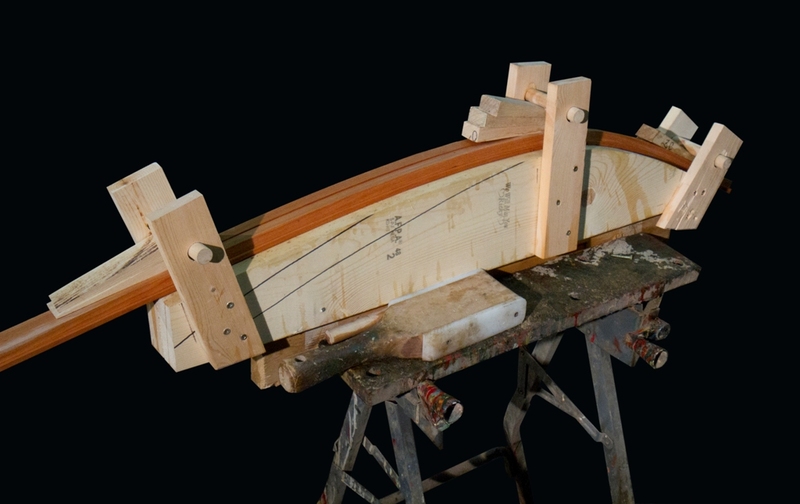 Then, use a spring clamp at every second rib to hold one of the new outwales in place on the canoe. 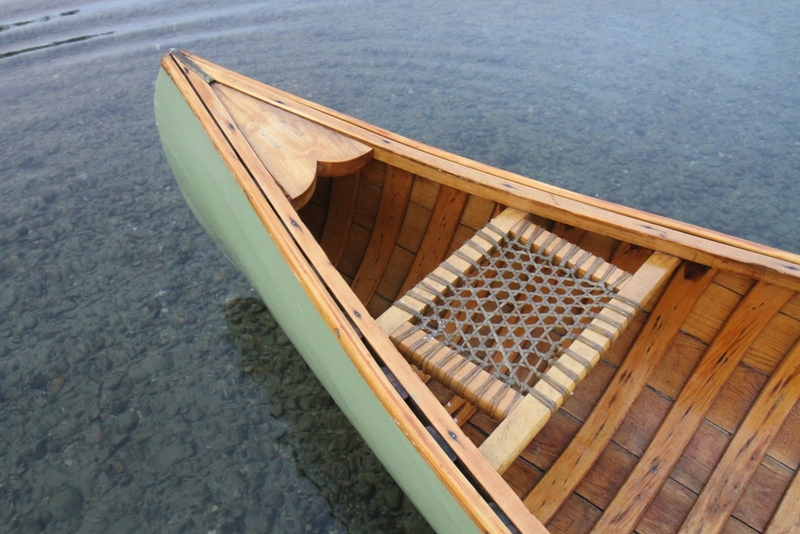 In this particular canoe, new cherry thwarts have yet to be installed. I used ratchet straps to draw the hull into its correct shape. Sometimes the wood bends too much at the ends. If so, wrap rags around the ends of the outwales and keep them soaked for about three days. The wood will relax and come into its correct position. 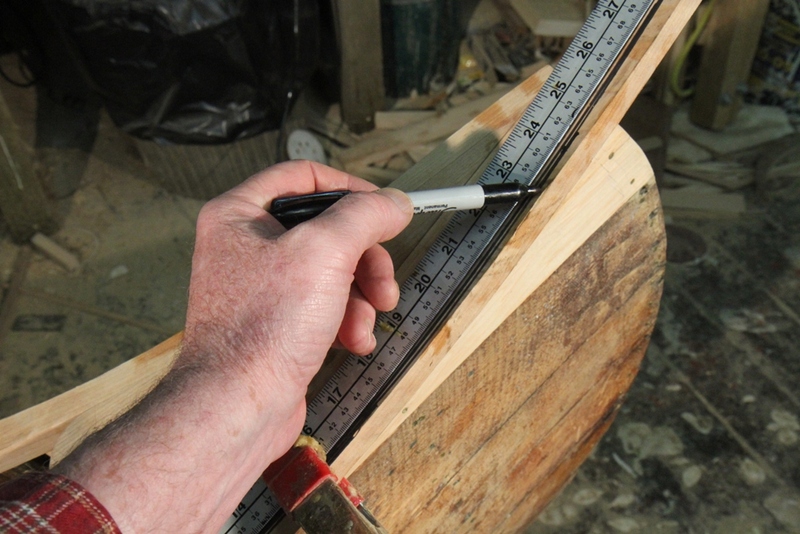 Mark the width taper into each end of the new outwale. Cut the width taper with a saber saw. 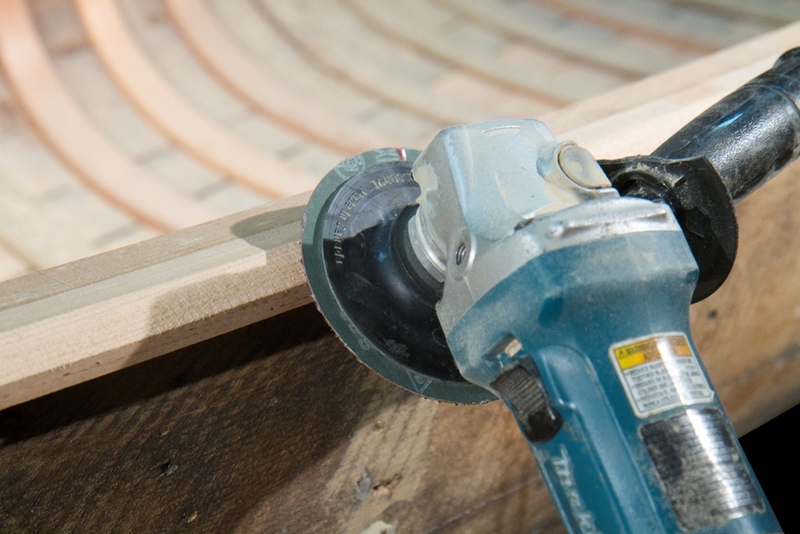 Use a random-orbital sander and 60-grit sandpaper to smooth the cut and even out the width taper at each end. 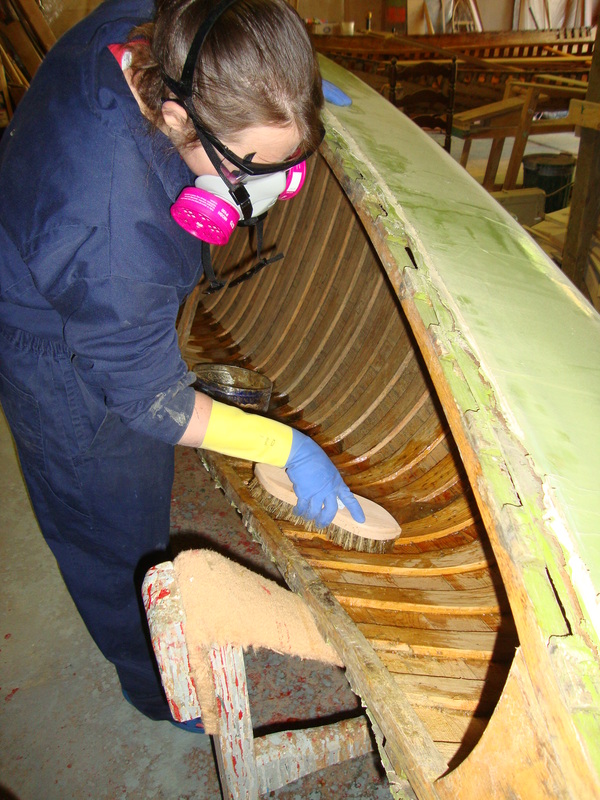 Start attaching the outwale to the canoe at the centre and work to each end. 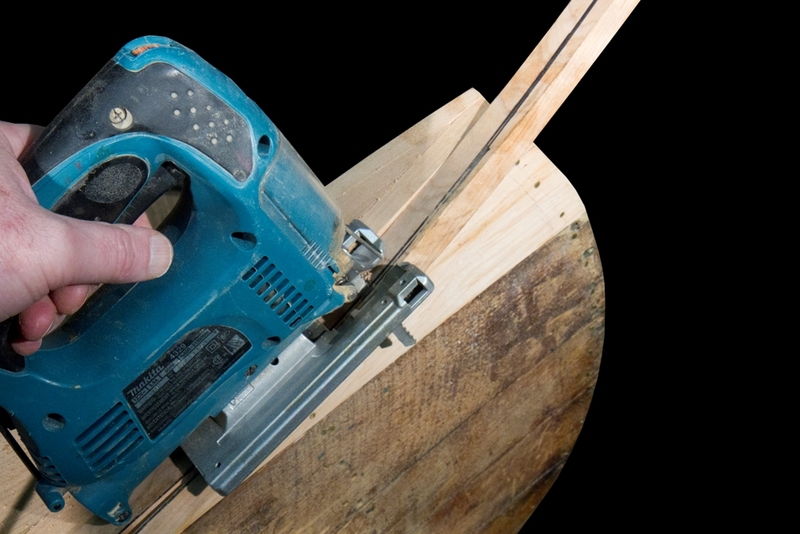 Make sure the top-edge of the outwale is flush to the top edge of the inwale. Pre-drill and counter-sink holes for 1½” #8 bronze flat-head wood screws which are driven from the inside through the inwale into the outwale. 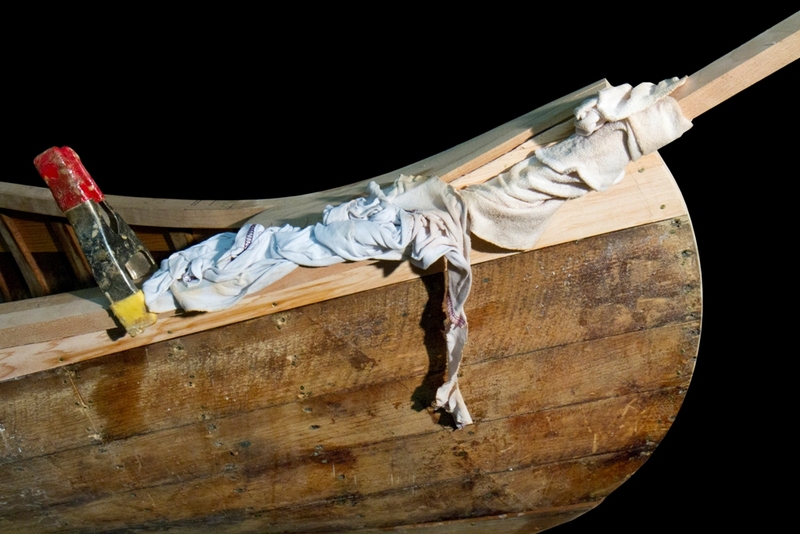 Originally, they placed a screw between each rib in the canoe. 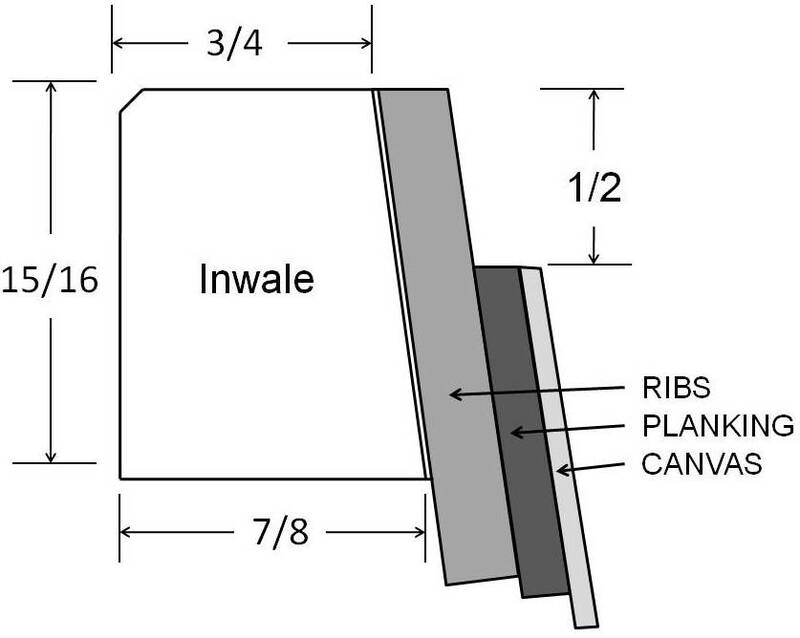 I replicated their process, but I see no reason why you couldn’t use a screw between every second rib. The last five screws at each end are driven from the outside through the outwale into the inwale. Position the outwale a little high at each end. As the final sanding is done, each end will be tapered (He ≈ 0.75 x H). Each end of the outwale is trimmed flush to the stem-end. Install the second outwale in the same manner. 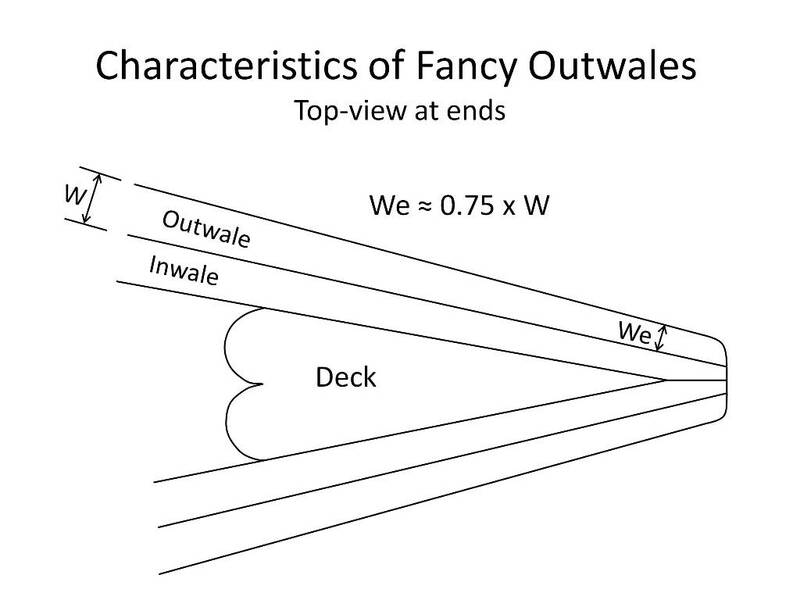 Be sure the height taper and final height of both outwales are the same at each end and on both sides of the canoe. 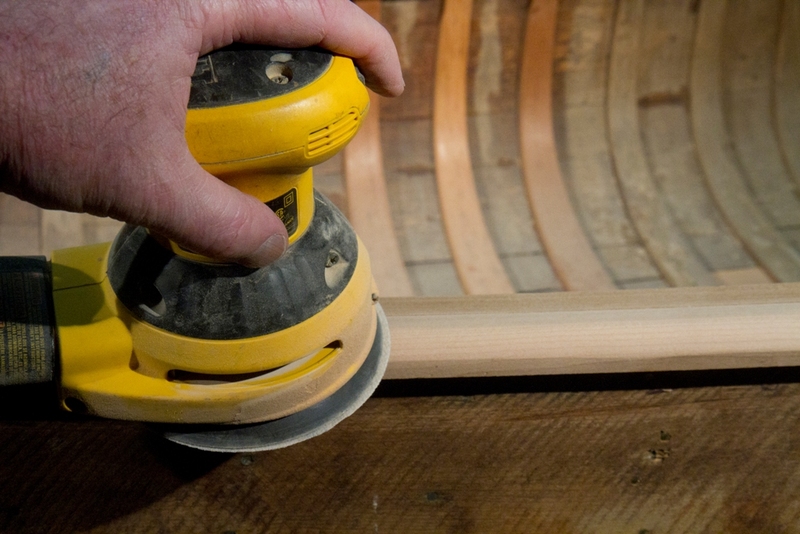 Then, use an angle grinder set up with a 24-grit sanding disk to carve the top-edge angle into the outwales all around the canoe (TE° ≈ 15°). 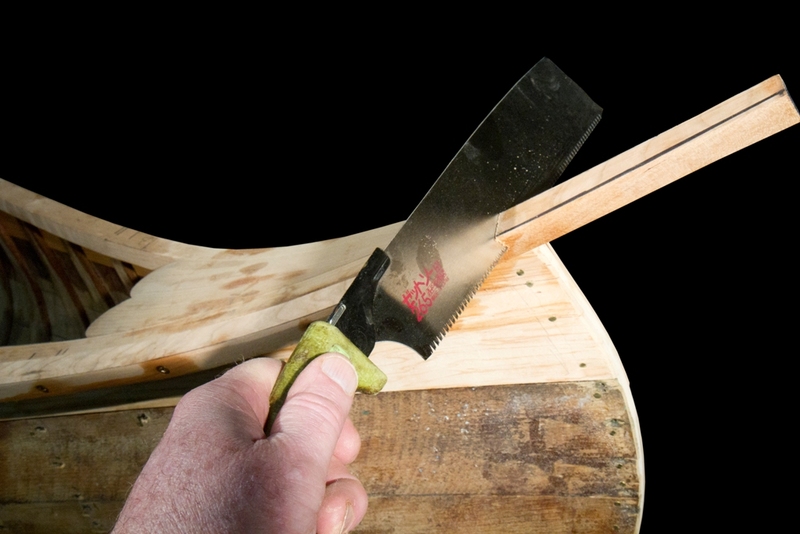 Be sure to leave enough material in the top-edge to allow for final shaping and sanding. Sand and shape the outwales with a random-orbital sander. Start with 60-grit sandpaper and work progressively down to 220-grit. The final shaping is done more-or-less by eye until a pleasing shape is achieved. Wet down the outwales and decks with water and allow them to dry. This will raise the grain of the new wood. 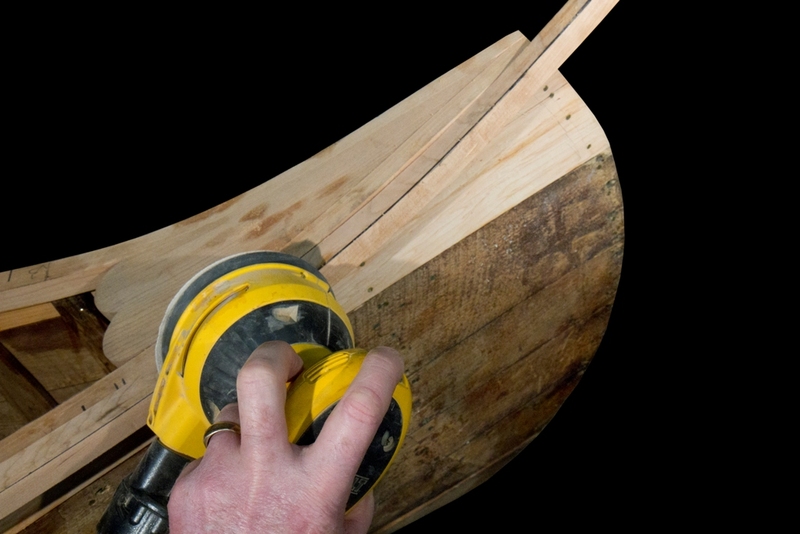 Use dry sandpaper for hand-sanding in progressions from 320-grit to 600-grit until the wood is polished. Stain all of the new wood to match the original. 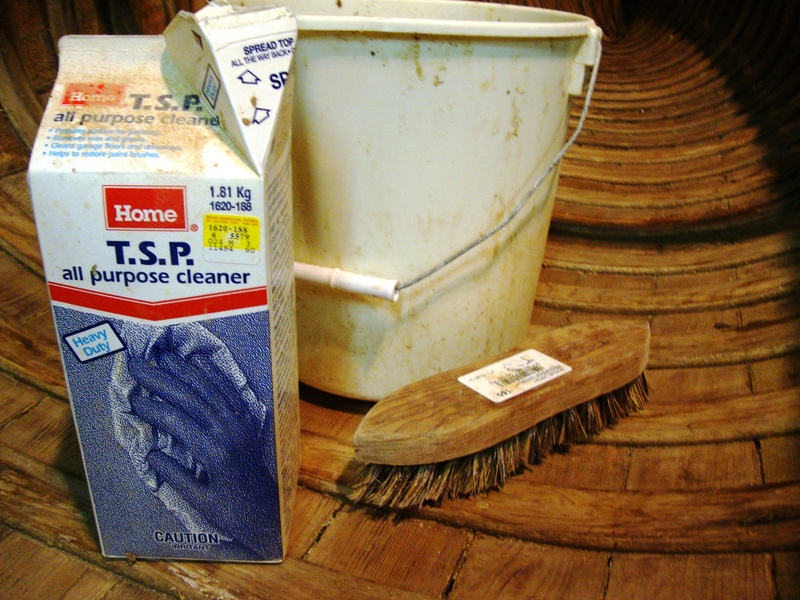 Remove the new outwales and apply final finishing with shellac and varnish on all of the surfaces. 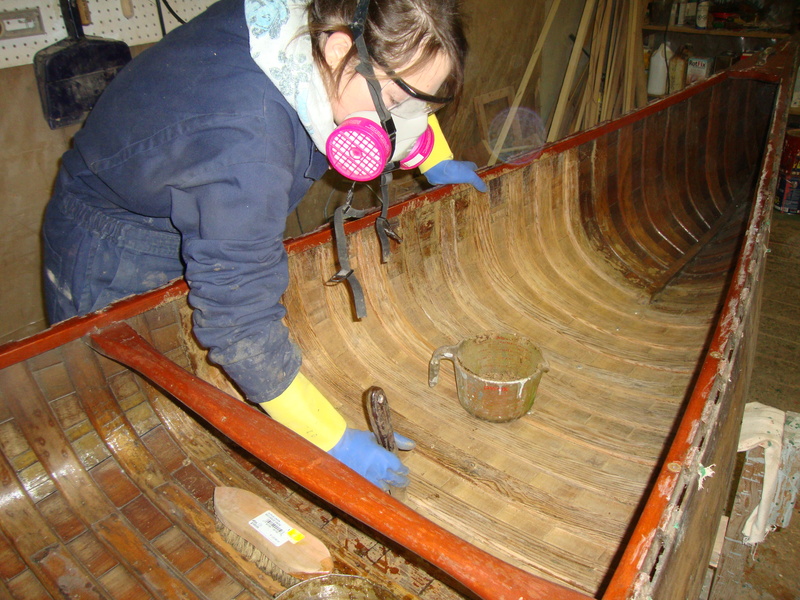 In this canoe, the outwales will be re-installed after the canoe is canvassed, filled and painted. 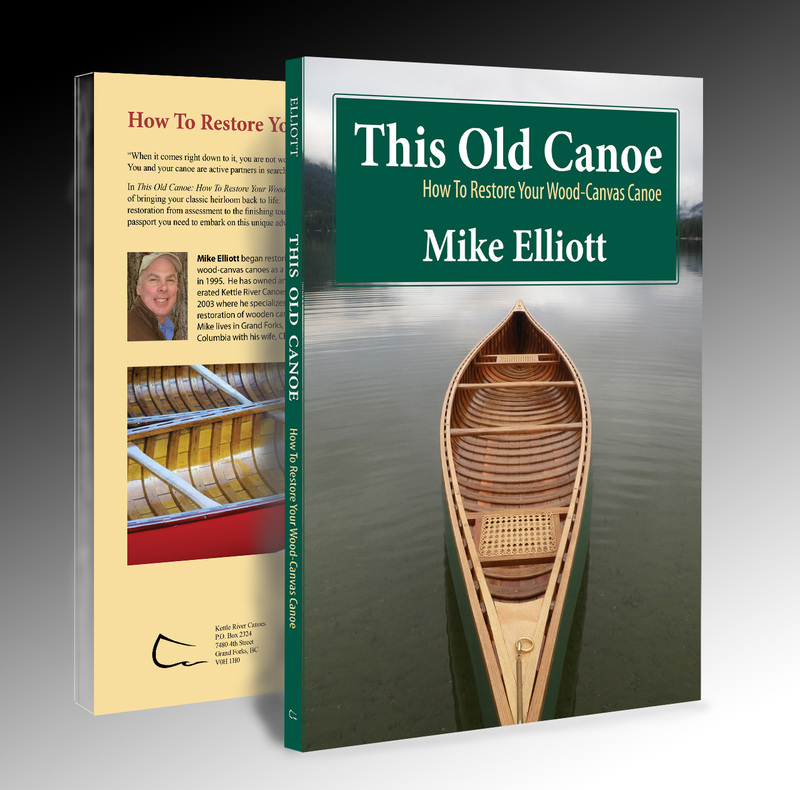 The entire restoration process (including gunwale repairs and replacement) is described in my book – This Old Canoe: How To Restore Your Wood Canvas Canoe. 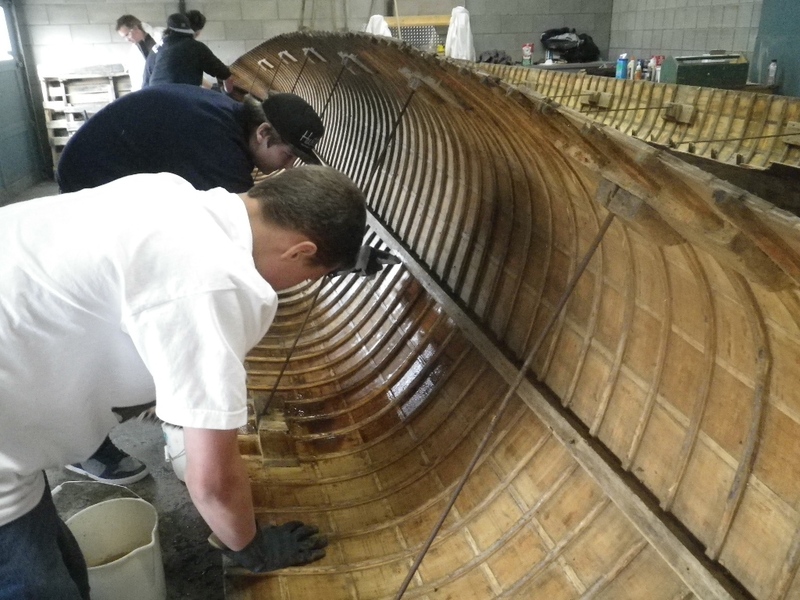 If the seats in your canoe are laced with rawhide similar to that in old snowshoes, chances are you own a “Huron” canoe – the generic name for canoes built in Huron Village (renamed Wendake in 1986). 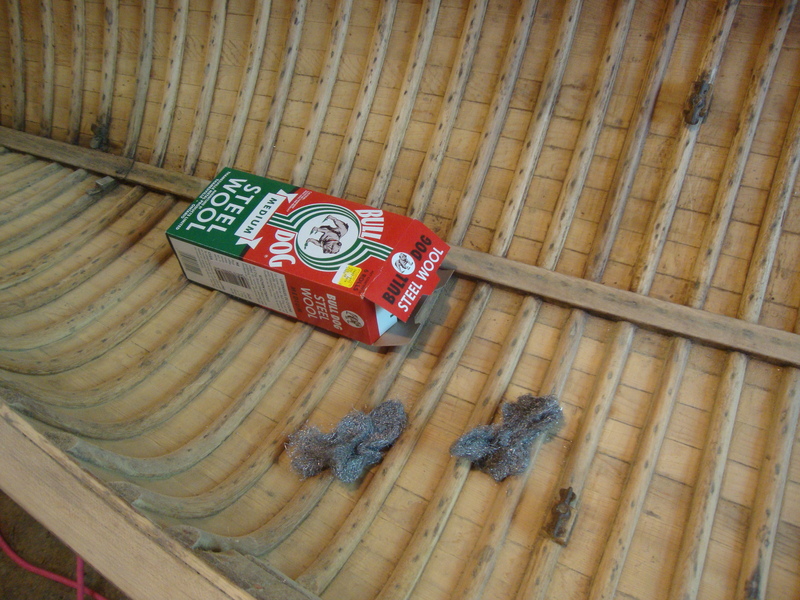 The “babiche” is likely to last longer than the canoe, but at some point you may need to re-lace the seat frames. 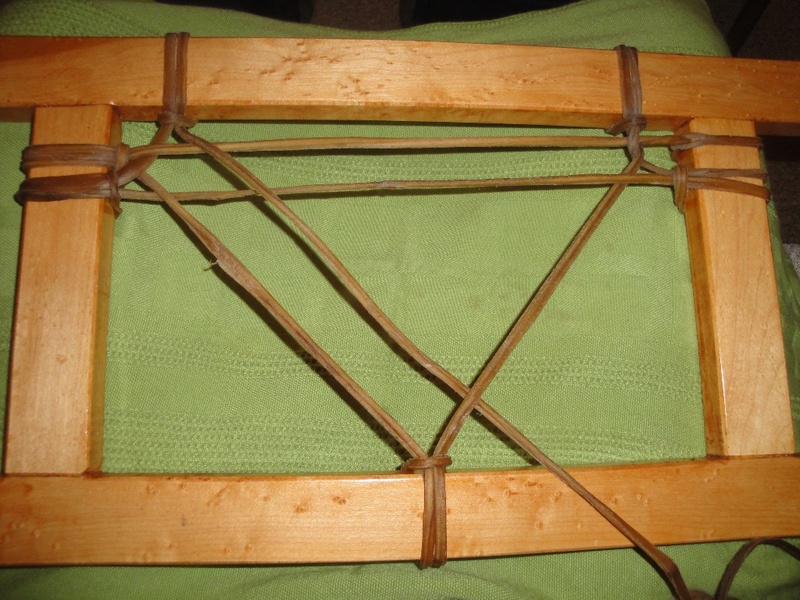 Seat frames for “Huron” canoes are constructed of birch or maple and assembled with mortise and tenon joints that are very rough and loose. 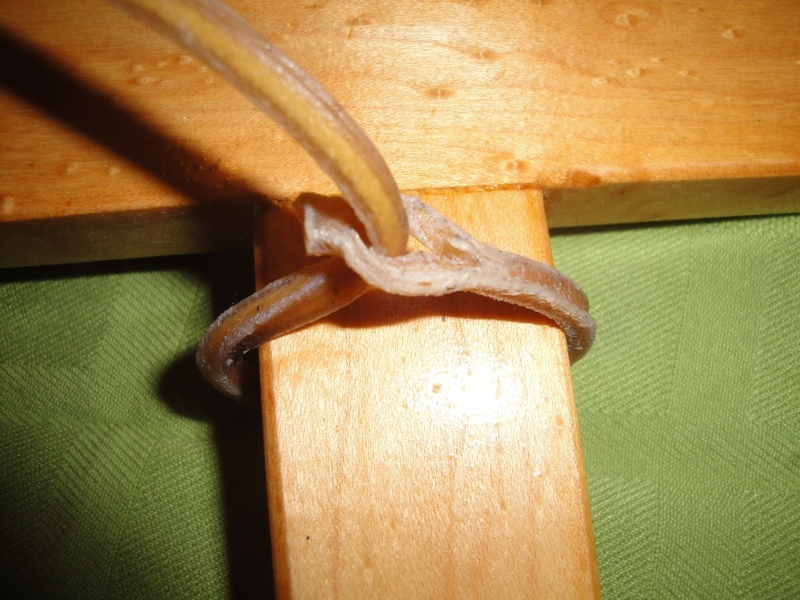 No glue is used in the joinery, so the rawhide lacing is the only thing holding the frames together. As with all of the other components in a canoe, I prefer to apply finish to the frames before I lace them. 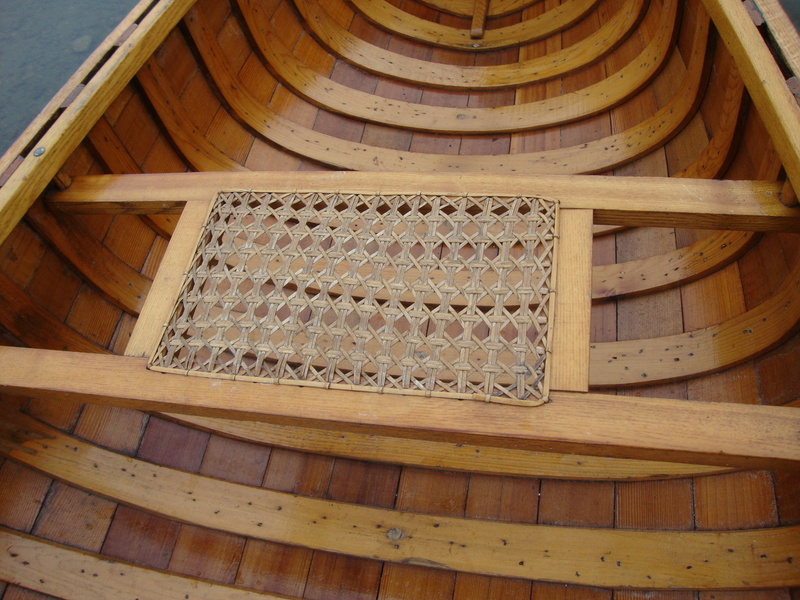 The bow seat requires about 65’ (20 meters) of 3/16” (5 mm) rawhide lace while the stern seat requires about 50’ (15 meters). The lacing is usually shipped in a long tube and is as hard as a rock. It has to be soaked for several (5 or 6) hours before it can be used to lace the seats. I use the bath tub at home and add a little borax to the water to help loosen the rawhide and make it easier to manipulate. It will take a few hours to lace a seat, so keep a large bowl of water nearby in order to re-soak the lacing as you work. Handling rawhide lace for several hours can be hard on the hands and the borax can really dry out your skin. Use a hand lotion both before and after lacing a seat to help avoid damage to your skin. 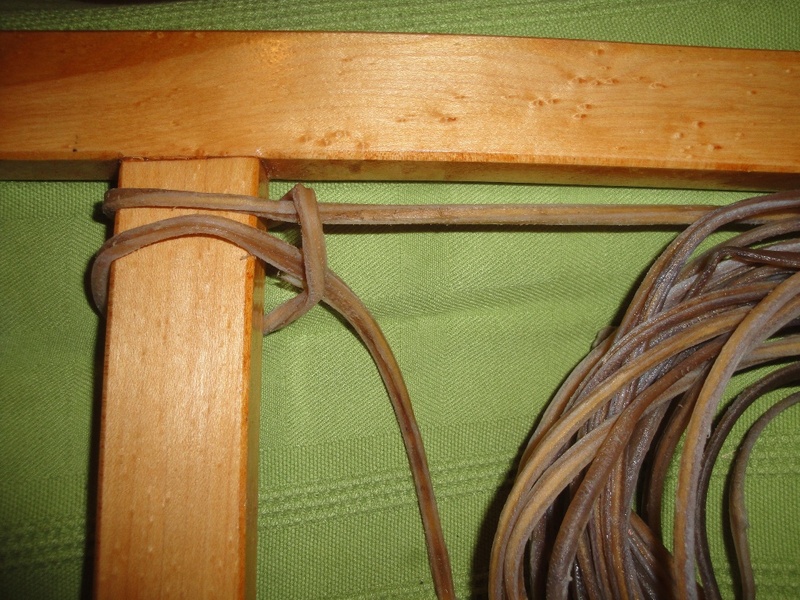 The lacing pattern I describe is the most common one found in canoe seats. It is by no means the only one. The process can be applied to all the other patterns. However, some are more complicated than others. 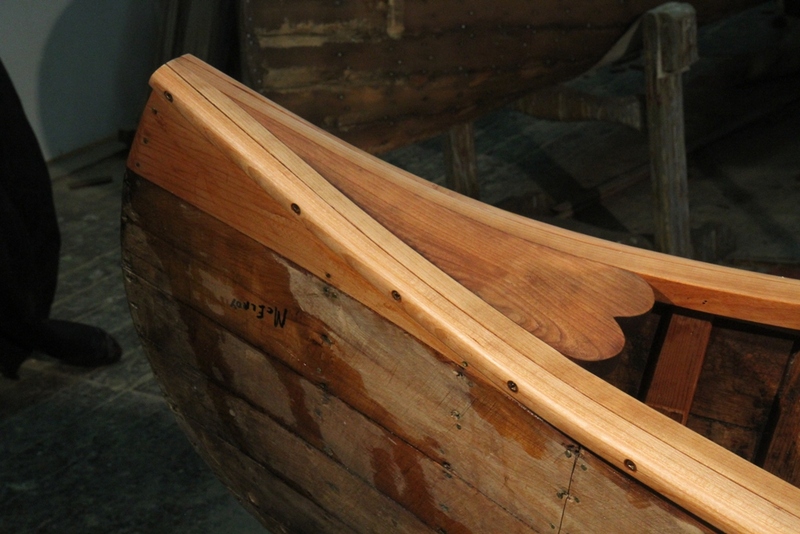 The stern seat has 36 anchor-points – 9 on each of the 4 frame rails. The bow seat is wider than the stern seat. Therefore, it usually has 11 anchor-points on each of the frame rails. In order to make this fit, the anchor-points on the side rails are placed very close together. This will provide enough room for one more complete repetition of the pattern. The only tool I use is a sharp pocket knife. 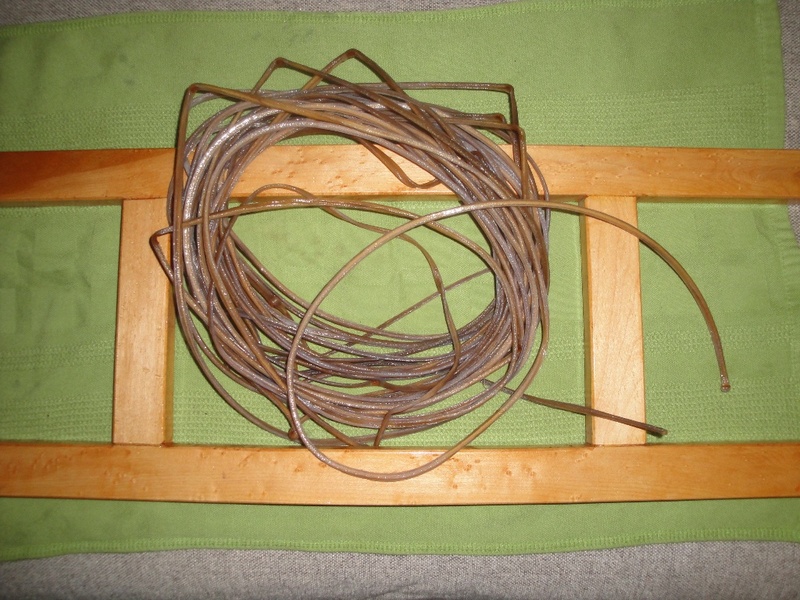 It trims the lacing and cuts small slits in the ends of pieces for joining. 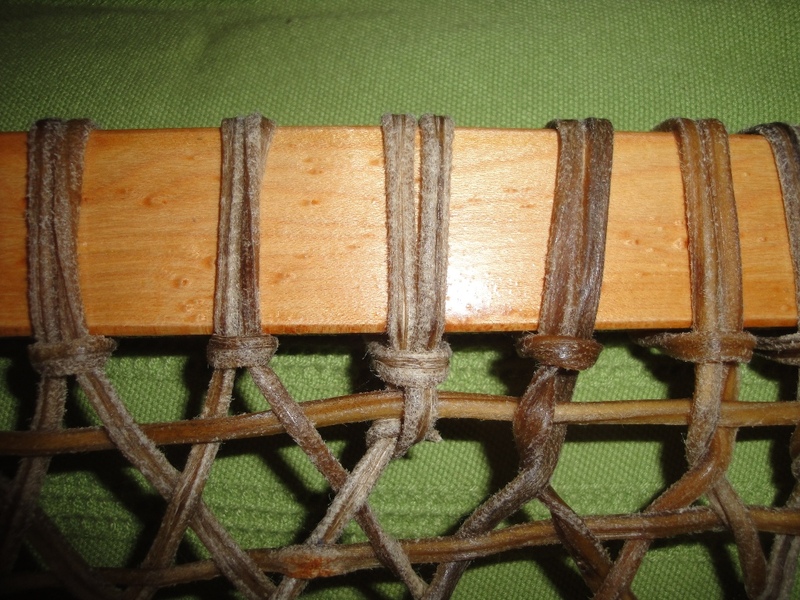 The entire pattern is laced using just a few basic knots and joins. The starting anchor join at 1.1 is made by threading the lace through a small slit in the end of the first lace in the pattern. Throughout the lacing pattern, pull the rawhide firmly but not tight. As the rawhide dries, it becomes very tight. 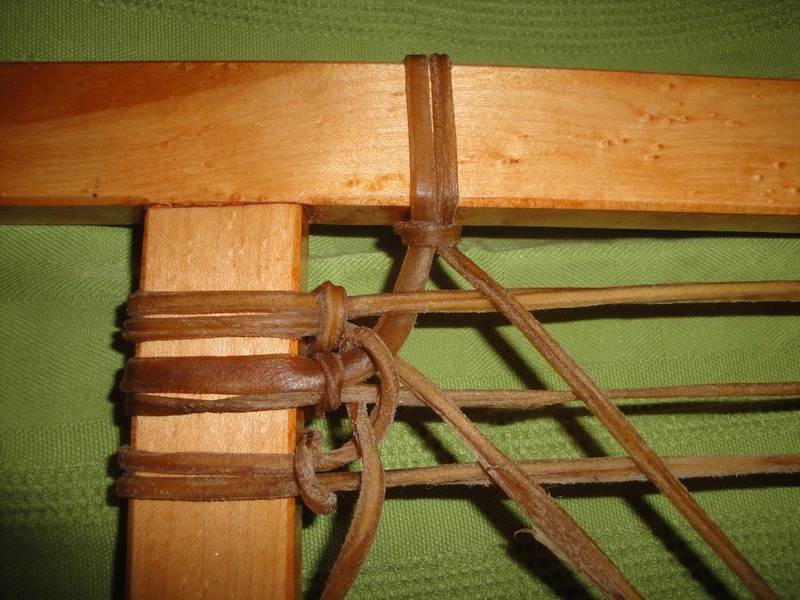 All of the remaining anchor points are tied using a larks-head knot. 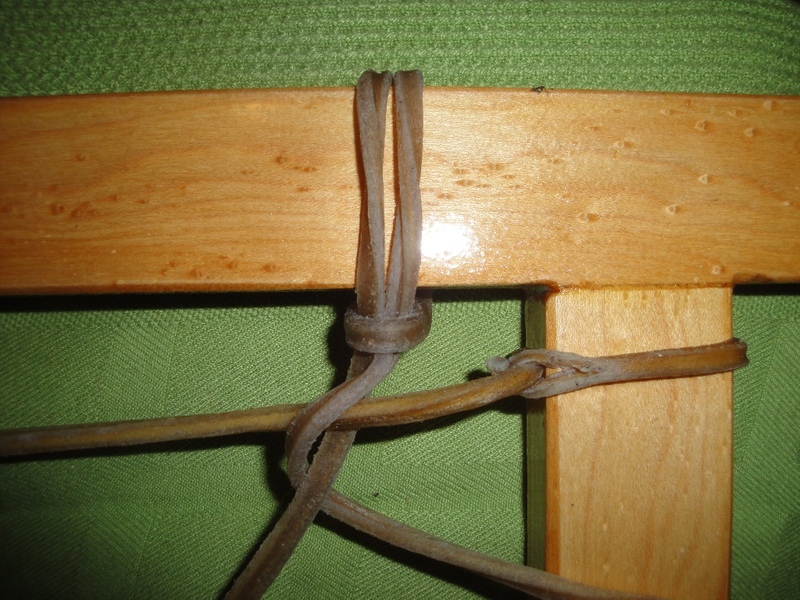 To perform this knot, you start by passing the lace over the frame. Wrap around to come up on the “outer” side of the lace and pass over the strand that was just made. 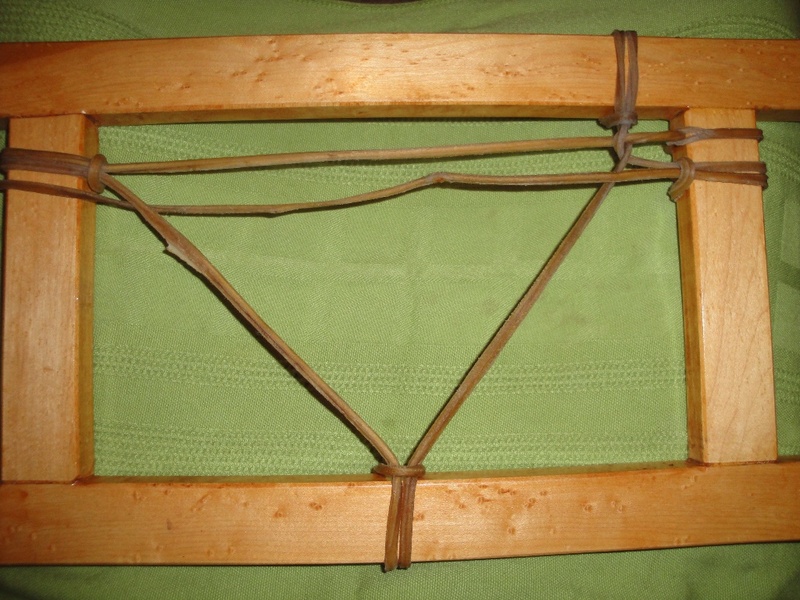 Bring the lace back under the frame, then around to finally pass back over the frame and under the lace “bridge” to form the knot. In this case, a picture is worth a thousand words, so use the photo as your guide. Anchor-points 1.2, 1.3 and 1.4 form a triangle pattern on the frame. As you go from 1.3 to create the anchor-point at 1.4, pass the strand under the horizontal. The strand then passes over the horizontal and under the diagonal “forward slash” ( / ) strand before tying off at anchor point 1.5. All subsequent weaving in the fourth strand follows this pattern. 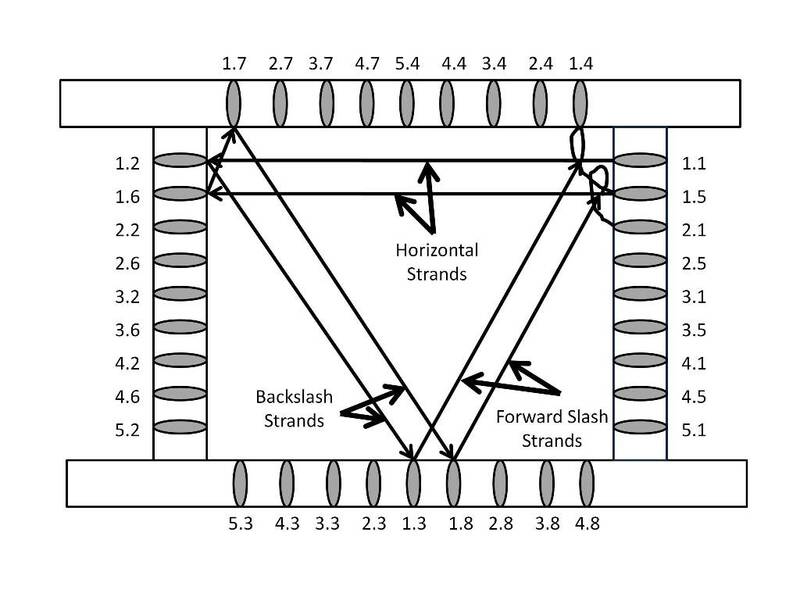 The fifth strand of the pattern passes over the forward slash strand and under the “backslash” (\ ) strand before tying off at anchor point 1.6. All of the subsequent weaving in the fifth strand follows this pattern. The sixth strand weaves over the “backslash” strand and under the horizontal strand before tying off at anchor point 1.7. All of the subsequent weaving in the sixth strand follows this pattern. The seventh strand passes over the horizontal strands and under the “forward slash” strand before tying off at anchor point 1.8. All subsequent weaving in the seventh strand follows this pattern. The eighth strand does not have any weaving, but it finishes by passing over both the fourth and the fifth strands at the fifth anchor-point in that repetition of the pattern. It wraps under the strands and then up and over itself before forming the first anchor-point in the next repetition of the pattern. From now on the pattern is repeated with one addition. 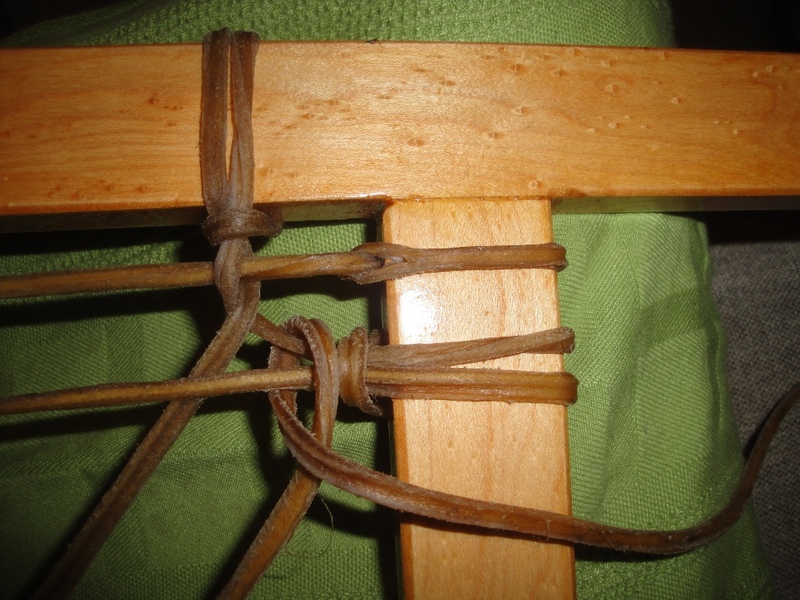 After forming the second anchor-point in the pattern and before weaving the second strand, stabilize it by passing over both the fifth and seventh strands of the previous set, then come up and over itself. 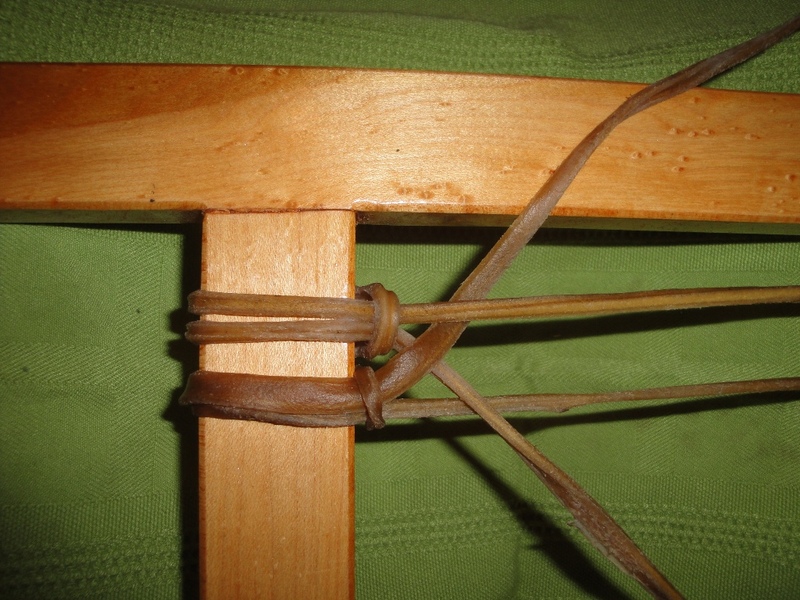 The second strand requires no weaving. 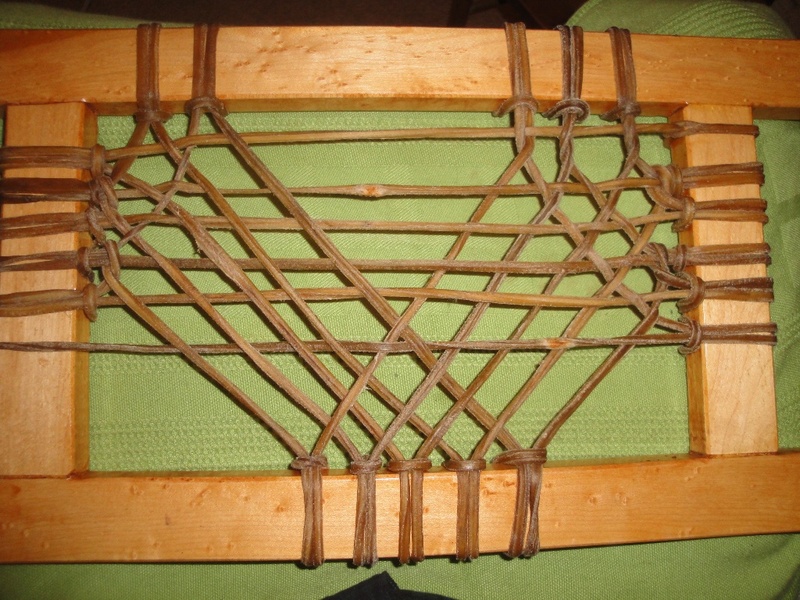 The seat is woven with progressively more and more weaving required as each set of the pattern is performed. At some point, usually two or three times in a given seat, you come to the end of a piece of rawhide lace. 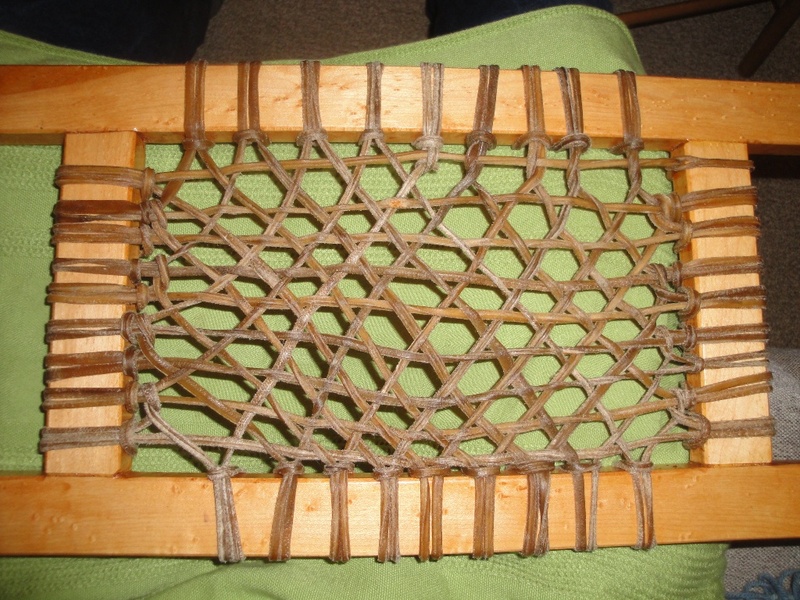 To continue weaving, join the next lace to the previous one. 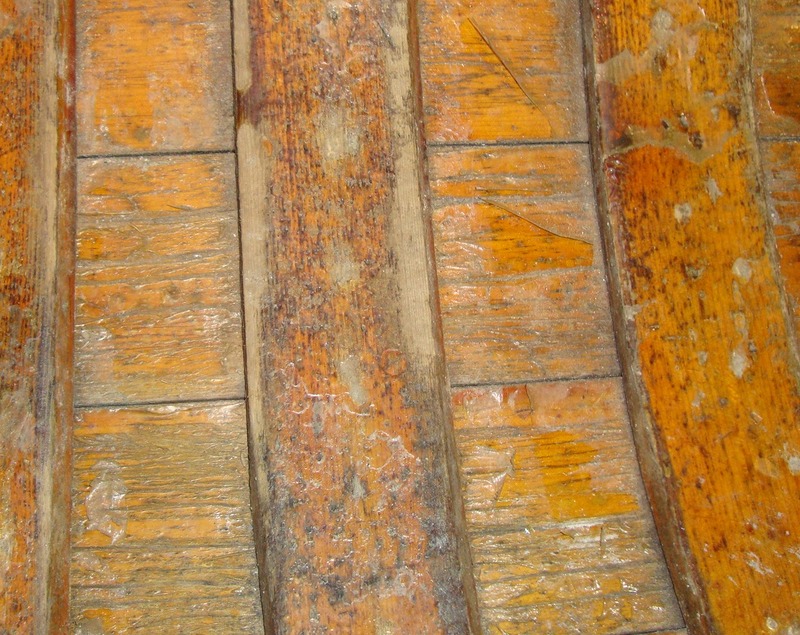 The joins are made by cutting a small slit in each end. The end of the old strand is passed through the slit in the new strand. The entire new strand is then fed through the slit in the end of the old strand to create a secure join. I like to locate the joins so they lie on the underside of the frame. 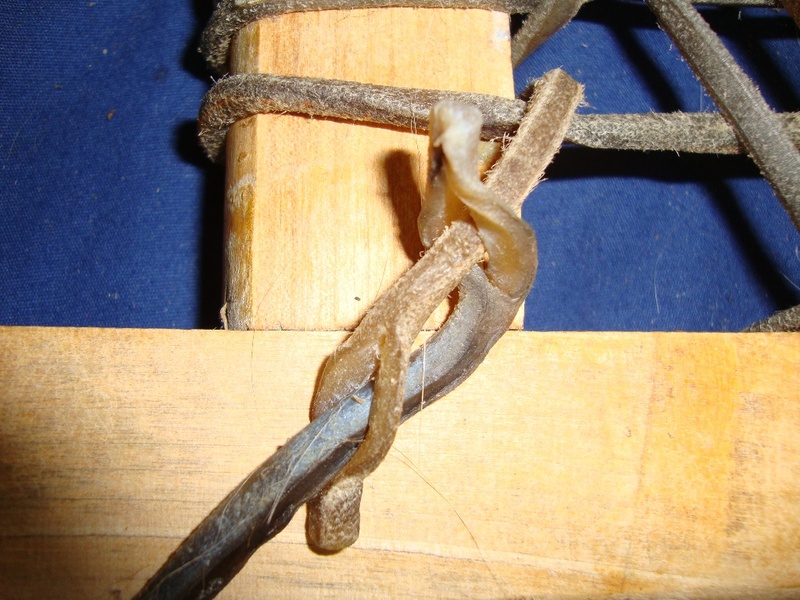 Once you have completed the lacing pattern, the last larks-head knot is tied at the final anchor-point and the rawhide is knotted with one or two half-hitches. Allow the rawhide to dry for a couple of days. 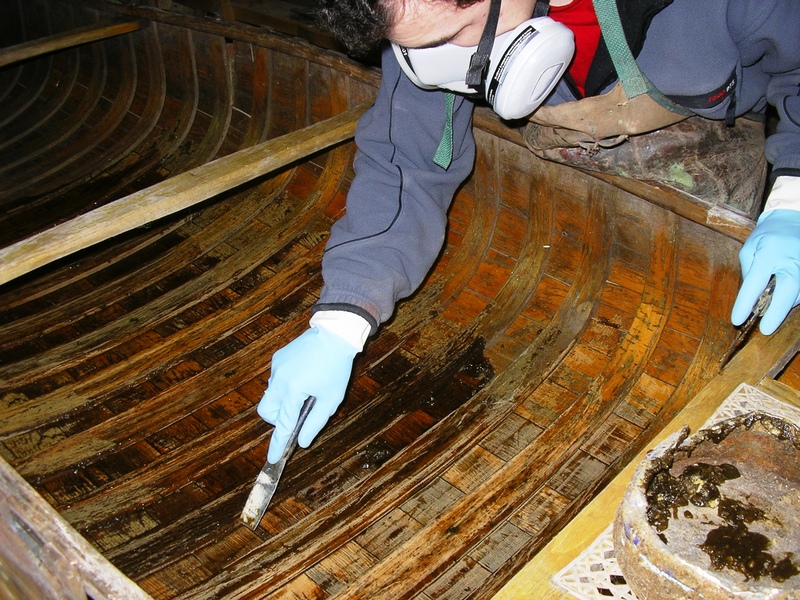 Then apply a mixture of two parts boiled linseed oil and one part turpentine. Let the oil mixture dry for at least a week. 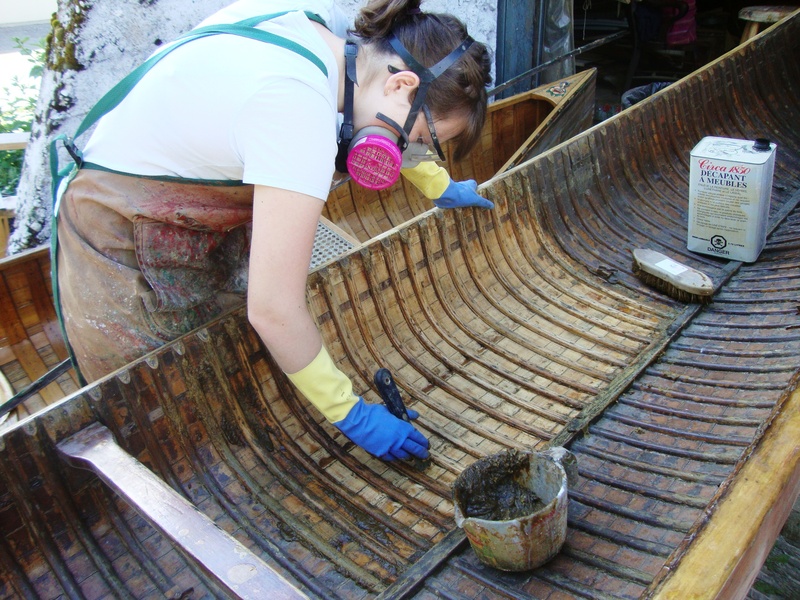 The seat will be finished with spar varnish (thinned 12% with painter thinner/mineral spirits).